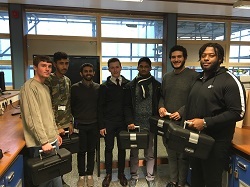 Electronic Engineering competition for 2nd year students - winners announced! 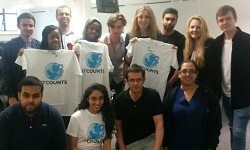 Congratulations to 2nd year students, Hassan Elmasry, Rashid Nkrumah, Jacob Sewell, Salim Alsalami, Saju Mohsin Abedin. 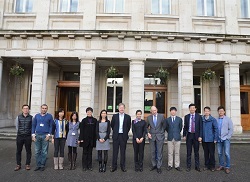 A delegation of staff and students from the Beijing University of Posts and Telecommunications (BUPT) visited Queen Mary to meet with colleagues from the Joint Programme with BUPT (JP) and other QMUL staff in January-March this year. Students on the Queen Mary University of London (QMUL) Degree Apprenticeship Programme in partnership with Goldman Sachs, talk about their experiences a year on. A group of QMUL students won a Europe-wide tech clash with their idea to create a collaborative virtual reality platform for education. At this year’s ITMB North Event EECS’ students demonstrate their tech and business savviness for the third year in a row, winning 1st and 3rd place in the team competitions and 3 individual spot prices from Shell, Sky and SAS. The ‘degree apprenticeship programme’ will allow participants to complete an apprenticeship within Goldman Sachs’ technology division, whilst studying for a degree at QMUL. Overall student satisfaction in Electronic and Electrical Engineering teaching in the School of Electronic Engineering and Computer Science has increased by 16% in the latest National Student Survey compared to 2014 to 82%. 1st year student Balwinder Singh was chosen as one of only five students from UK universities to attend the event held in Amsterdam this month. And after three days of workshops and challenges, his team walked away as winners of the final challenge - to design a solution to reduce food waste. 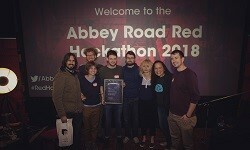 A start-up co-developed by EECS students that helps travellers use spare baggage capacity on flights for small charities won the 24-hour Sabre Destination Hack hackathon held in London at the weekend. EECS student Soham Trivedi's app Candle Path was selected as a winner of the iDEA 2015 competition, winning £15,000 of funding to develop the idea further. Congratulations to Brecht De Man, C4DM PhD Student, who was recently elected Vice-Chair of the Audio Engineering Society's Student Delegate Assembly. 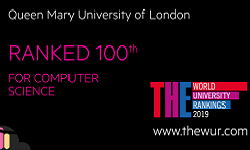 Computer Science at Queen Mary University of London is ranked in the top ten, with an overall student satisfaction rate of 93 per cent, according to the latest results of a nationwide poll of final-year undergraduates. EECS staff and students would like to congratulate all new graduates as they received their degree certificates at the School of Electronic Engineering and Computer Science Graduation Ceremony on Thursday July 18th. Over 450 undergraduates on a pioneering joint programme run by the College with China’s best telecommunications-specialist university received their dual degrees in Beijing. A team of EECS undergraduates has progressed to the semi-finals of the very competitive IBM University Business Challenge. In this competition students work as a board of directors in a series of simulated companies, making business decisions that affect company performance. The competition is very realistic so has given these students an opportunity to put their knowledge into practice. 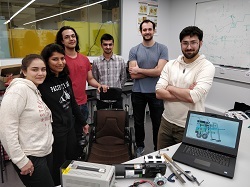 We wish the team – Edward Gilbert, Manetou Gueye, Xenia Lahodynsky, Fan Wang and Simon Wycliffe – all the best for the live semi-finals early in 2013, with thanks to Dr Paolo Oliva from EECS for supporting students every year in this challenge. 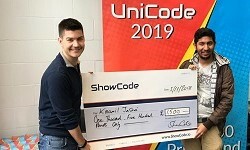 A Computer Science student from Queen Mary, University of London has received a £5,000 prize for his work in developing a smartphone app for leading property website, Rightmove.